On February 9th, we hosted a webinar about attaining fast and successful HR service delivery transformations in 2017. 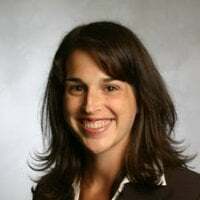 In HR Service Delivery: Your Secret to Fast Success in 2017, Andrea Couto, Sr. Director of Solutions Consulting, and I outlined a pathway to streamlined HR processes through a service delivery platform that immediately generates positive results, such as improving employee engagement, increasing HR productivity and agility, and transforming HR for the digital workforce. 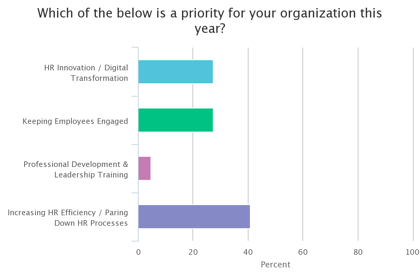 During the webinar, we asked participants to tell us their organization’s top priority for 2017 from the following 4 options: 1) HR Innovation / Digital Transformation; 2) Keeping Employees Engaged; 3) Professional Development & Leadership Training; and 4) Increasing HR Efficiency / Pairing Down HR Processes. Over 40% of respondents choose #4. At PeopleDoc, we pride ourselves on providing digital solutions that increase efficiency and streamline processes for HR. Our innovative platform is easy to use, available on all mobile devices, and lends in-depth insights into how HR is performing to continually improve efficiency. In line with our mission to support streamlined HR services and operations, we prioritize efficiency and time-saving in our implementation process as well. Transforming HR can seem like an endless process, particularly with the lengthy implementation projects you may encounter with systems like an HRIS. When progress feels slow, enthusiasm can wane and the project can even lose support. With PeopleDoc, you can transform your HR operations in a matter of weeks with just one, comprehensive platform, fueling quick wins and keeping your employees engaged in the project. Looking at the case of Nestlé, an organization undergoing a major HR transformation initiative, the entire implementation project for France took a total of 3 months to complete, and required just 10 days of Nestle’s time. Since going live, Nestle has reported a 30% increase in HR productivity. PeopleDoc truly believes in the power of HR to make the world’s best companies, and we are dedicated to providing support and innovation that matters. Rather than bracing for a marathon, we want you to feel that HR transformation can be a sprint. Our process aims to keep people excited and your project invigorated, while effectively managing substantive and game-changing transformations.